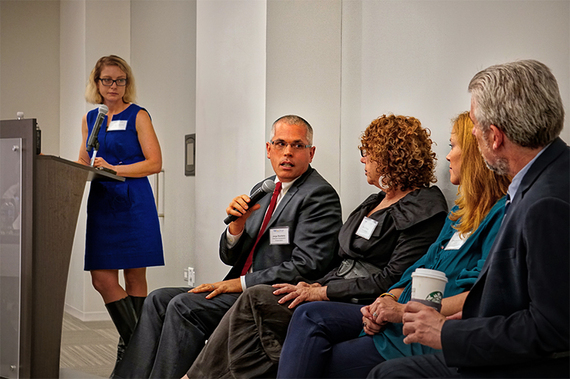 "Crowdfunding is just the Internet," stated Attorney Mark Roderick as he opened last month's RealCap Chicago. RealCap is an annual conference that joins crowdfunding leaders and innovators to propel the industry on a pathway of continued progression. Though real estate crowdfunding in its most basic incarnation is simply the internet arriving to real estate investment, Roderick and dozens of industry professionals proved that it is much more. Discussions at this year's event emphasized pressing topics including SEC regulations, effective marketing to launch and promote crowdfunding platforms and projects, impact investing, and the role millennials play in the industry's development. Ben Armstrong of GroundFloor and Heather Schwarz of EarlyShares personified a pertinent dichotomy in the crowdfunding industry: raising capital from accredited investors exclusively, or allowing both accredited and non-accredited investors to participate through Regulation A or Title III offerings. According to their website, GroundFloor is the first and only real estate lending marketplace open to non-accredited investors. Armstrong described their capital-raising strategy to include a high volume of low dollar amounts that will still generate returns. "The most successful and the cheapest forms of capital come from the broadest base," he stated. Schwarz and her team at EarlyShares focus instead on accredited investors placing large sums of capital in real estate endeavors, with an investor pool including several family offices. This contrast in capital-raising strategies and investment offerings represents the variation in SEC regulations that shape capital formation in the crowdfunding industry. Whether a platform appeals to accredited, non-accredited, or both types of investors, solidified marketing strategies are essential to conveying their unique messages. According to Ben Schulman of Small Change, "marketing is all about storytelling." In order to connect with investors and inspire them to place capital in meaningful developments, platforms must focus their stories. Matt Abeles, co-founder of BuiltWorlds, described that for his company, "the best way we can engage a large audience is to talk about where the technological future of the built environment lies." He stressed that producing original content is essential to conveying a company's message. AdaPia d'Errico, chief marketing officer at Patch of Land, agreed that crafting a unique and authentic narrative will attract participants to crowdfunding sites. "When I joined Patch of Land, I sat down with the founders to identify the core values that they want to be known for." D'Errico explained that developing and presenting a clear message will gain the trust of prospective investors. "Real estate investment and the Internet are really scary, fraud-ridden industries and you have to gain trust in order to attract investors." Nowhere is conveying messages more important than impact investing. Many crowdfunding platforms and leaders are part of a movement to place capital in businesses and organizations that seek environmental and social justice. The messages of their platforms express a desire to strengthen American infrastructure, communities, and the health of our ecosystems through high impact investment. Marty Coyne, chief technology officer at Connected Investors, raised an issue impact investing platforms are currently facing. "There are some people who probably won't invest when they hear the word 'impact,'" he explained, "because they assume they are not going to get as much return as they could elsewhere." With prospective investors assuming that philanthropic missions impede strong returns, impact investing leaders must communicate that promoting justice and generating returns are not mutually exclusive. Meaningful marketing and impact investing lead to considerations of millennials as potential crowdfunding investors. As a generation largely interested in technology and societal progression, the values of millennials align with crowdfunding's mission. Author and impact investing fund manager Ben Bingham predicted that "millennials are going to be very interested in this industry, and I think they already are. They want to support businesses that act responsibly toward our society and environment." As a generation of young people eager to spark positive change, millennials may be a key to growing crowdfunding's reach. Crowdfunding is on its way to transcend real estate investment and create a larger narrative of global change. With its current technology and existing participants, crowdfunding has already established itself as a revolutionary industry that has broken investment restrictions and increased opportunities for millions of Americans.